To ensure a stress-free conduct ofNEET 2018, CBSE has notified candidates to follow the examinationrules at the exam center. NEET exam stress is building up each day asthe examination day is nearing and so with the last minutepreparation, students end up missing the important instructionsmentioned on the NEET Admit card. Hence, here a reminder! 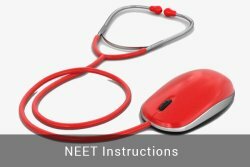 Throughthis article you will know NEET Exam Day Instructions which ismandatory for each student to comprehend. The Examination Centre will be opened 2 hours and 30 minutes before the commencement of the test. No candidate shall be allowed to enter in the examination centre after 09.30 a.m. Therefore, candidates must leave home well in advance considering all facts like traffic, the location of the centre, and weather conditions, etc. Candidates are expected to take their seats immediately after the opening of the Examination Hall. Candidates are advised in their own interest not to bring any of the barred items to the venue of the examination as arrangement for safe keeping will not be made and candidates found in possession of these items will not be allowed entry in the examination centre. Candidates have to wear Slippers, sandals with low heels, not shoes. Wear light color clothes like Jeans, Pant, Shirt (half sleeves only). The button of the shirt should be medium size not big enough. Male candidates cannot wear Kurta Payjama and closed Shoes. Only slippers or sandals are allowed. Candidates are not allowed to carry the following items inside the examination center under any circumstances. If found with any of these barred items, then the authority has all the rights to expel the candidate from giving the examination. The candidates will be subjected to extensive and compulsory frisking before entering the examination center with the help of highly sensitive metal detectors. Any stationery item like textual material (printed or written), bits of papers, Geometry/Pencil Box, Plastic, Pouch, Calculator, Pen, Scale, Writing Pad, Pen Drives, Eraser, Calculator, Log Table, Electronic Pen/Scanners etc. Any communication device like mobile phones, Bluetooth, earphone, Microphone, pager, health band, etc. Other barred items include wallet, googles, handbags, hair pin, hair band, belt, cap, scarf, charm/tabeez etc. Any metallic item.  Any Watch/Wrist Watch, Bracelet, or camera. Any other item that can be used for unfair means.